Meanwhile many Democrats accused Trump of making the United States look weak. These reversals in party rhetoric were not the most striking aspect of summit commentary, however. Post-meeting criticisms from pundits, politicians, and experts were of two kinds. The first was perfectly reasonable; the second should trouble anyone with a genuine interest in arms control. Fair enough. The summit was more showbiz than arms control. It was not preceded, as would usually be the case, by months of painstaking, lawyerly negotiations between deputies to hammer out areas of agreement and disagreement, the latter to be resolved (if possible) by the two national leaders. Instead, it was largely a good-natured get-acquainted chat between two heads of state, accompanied by displays of mutual respect and followed by extravagant statements about denuclearization that are largely aspirational. Still, given that the two leaders in question were, just a few months ago, threatening to attack each other with weapons of mass destruction, this is clearly progress, even if it falls far short of an actual arms control agreement. Such comments are, for a start, myopic. They make it sound as if the summit was a zero-sum prestige contest in which North Korea walked off with all the prize money. But the footage of the two smiling leaders represents a liability as well as a win for Kim. It may show that he is a player on the world stage, but for a regime that has built its legitimacy over decades around the notion that Americans are evil devils who cannot be trusted, such images also pose a danger. 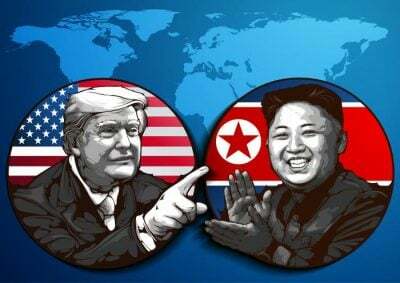 If Americans can be partners after all, what gives legitimacy to the hermit state and the iron-fisted discipline with which the Kim family has ruled? Remember: the Soviet regime was undone by glasnost, not decades of nuclear saber-rattling. To state the obvious: with 10 to 20 nuclear weapons, North Korea is, whether we like it or not, now a member of the nuclear club. Any diplomatic strategy that treats North Korea the way it was 20 years ago, the way the United States wishes it still were, is an exercise in futility—unless the whole point is to put North Korea in what is no longer its place. American national security experts like to talk about being “realists.” It is not realistic to treat North Korea as if its nuclear weapons make no difference to its status. Hugh Gusterson is a professor of anthropology and international affairs at George Washington University. His expertise is in nuclear culture, international security, and the anthropology of science. He has written two books on the culture of nuclear weapons scientists and antinuclear activists: Nuclear Rites: A Weapons Laboratory at the End of the Cold War (University of California Press, 1996) and People of the Bomb: Portraits of America’s Nuclear Complex (University of Minnesota Press, 2004).